Kennedy's premise-argued and documented here as never before-is that the verdict of Appomattox was largely reversed during Reconstruction. A determined southern oligarchy, he says, wrenched political and cultural victory out of military defeat. 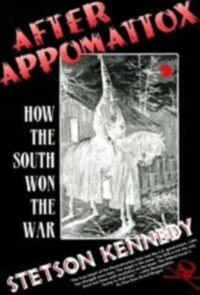 In this dramatic contribution to the history of Reconstruction, Kennedy brings to light thirty-three long-buried testimonials from victims and perpetrators of Ku Klux Klan terror that were taken by a Joint Congressional Committee in 1871-72. They form the core of this account of the decade following the Civil War, which Kennedy describes as a period of “holocaust, demagoguery, chicanery, fraud, and psychological warfare that culminated in the Deal of 1876. That “deal”, struck between Democrats and Republicans in a smoke-filled room of the Wormsley Hotel in Washington, D.C., essentially revoked the unconditional surrender of the South at Appomattox. It gave Republican Rutherford B. Hayes the victory in the disputed presidential election of 1876 in return for the withdrawal of federal troops from the southern states, and Kennedy contends that it diluted the power of the hard-won 14th and 15th Amendments and led to the imposition of the Jim Crow system after Reconstruction.